Guess what? Your neck curve is related to neck pain. I can show you a number of papers to support this but today I want to focus on one paper that was just published in the journal Aerospace Medicine and Human Performance. First off lets hit on some basics of the neck curve. The curve in your neck is described as a lordosis, the best way to describe this curve is if looking at it from the left side it should look resemble a ( or ) depending on which side you are looking at it. The best evidence shows that this curve is measurable and definable. There is an ideal and average normal measurement to this curve. Deviations away from the normal result in increased loading on the joints of the neck and contribute to pain and, over time, osteoarthritis. Traditionally the curve has been measured by the Cobb angle which is problematic. The method we use is the posterior tangent method which is just as reliable as the Cobb angle but has a smaller standard of error than the Cobb angle. The posterior tangent method has been on the fringe for a while but we are starting to see it used more often, as in this paper on the neck curve. While the result of this paper is neat, the methods are just as important because the authors used the posterior tangent method to measure the cervical spine. Back to the paper at hand, the authors examined 63 South Korean air force pilots. They measured the pilots cervical curve using the posterior tangent method and compared the measurements to the prevalence of neck pain. Of the 63 pilots, those who few fighter jets had worse neck curves than those who flew non-fighter jet airplanes. The fight pilots also had a greater prevalence of neck pain over the non-fighter pilots. The findings indicate that fighter pilots experience neck pain to a greater degree than non-fighter pilots and fighter pilots with neck pain have worse neck curves than other pilots without neck pain. Ultimately this paper shows that a loss of the normal cervical curve, no matter the cause (in this case flying fighter jets), leaves you more prone to having neck pain. 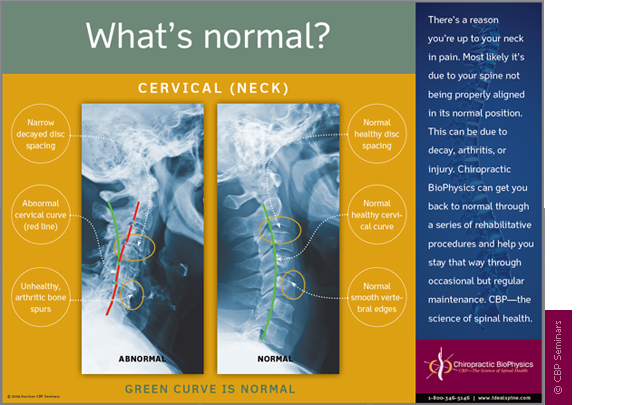 Your posture and the curves in your spine are there for a reason and any change in them, great or small, can result in pain and decreased function. This is not conjecture but a reality based on a growing body of published evidence. If you want to achieve real, long lasting relief from spine pain your posture needs to be addressed. Our practice is uniquely qualified to correct your posture and the curves in your spine. If you want to learn more, give us a call today.